According to the FAA, there are over 2 million drones populating the skies of the US alone. Drones have become a worldwide phenomenon, and their use in aerial photography has created a new way of looking at that world. Stills and videos that once required an aircraft charter are now being shot with a drone carried in a backpack. With over 1.5 million posts on Instagram tagged with #drone, a revolution in photography is taking place over our heads. At the forefront of this revolution are the innovators who have instantly elevated drone photography to the level of art, pioneering their own distinctive bird's-eye view on genres ranging from landscape and architecture to nature and sports. 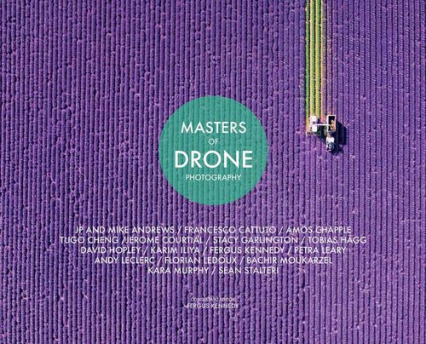 "Masters of Drone Photography" orbits the world of 16 leading lights, each with a creative vision of how, where, and why drones should be used to create stunning photography. Through probing Q&A style interviews, beautifully reproduced images, captions telling the story of each picture, and detailed technical information, the reader is given an insight into the photographers' working practices, from their career paths and inspirations, to the equipment and techniques they employ to create their breathtaking and visionary works.